War never goes out of fashion as a cinematic staple; even during the Obama-era, Lone Survivor, Act of Valor and 13 Hours flew the flag for the brave US soldier as global policeman. Danish director Nicolai Fuglsig's debut feature 12 Strong follows the same formula but comes up fresh due to a strong cast, large-scale production, and a narrative scope that dodges difficult political questions. Dampening down the mercurial gift for comedy he displayed in Thor: Ragnarok, Chris Hemsworth plays Mitch Nelson, a captain yet to experience combat. Watching reports of 9/11 hardens his resolve, and Nelson agrees to leave his office position to lead a small unit into Afghanistan. Their mission is to fight their way on horseback, village by village, to the Taliban stronghold of Mazar-i-Sharif, striking a blow against the forces of al-Qaeda. Drawing on his experience as a war photojournalist, Fuglsig has crafted an overlong but effective tribute to Special Forces team ODA 595, enhanced by excellent support work from Michael Shannon, Michael Peña and William Fichtner. There's acknowledgement of the role played by Afghan fighters led by General Dostum (Navid Negahban), yet 12 Strong isn't interested in changing minds about geopolitics; this Jerry Bruckheimer production is about providing bang for buck, and blowing up various New Mexico locations (which double for Afghanistan) manages just that. 12 Strong adapts Doug Stanton's 2009 book Horse Soldiers, which lifted the title from the classic 1959 John Ford / John Wayne western. Those looking for Wayne updated will find various traditions continued here: a square-jawed, taciturn figurehead, familiar warrior tropes in the men he leads, and a simplified conflict that offers gratifying triumphalism for those who crave stories of military success. General release from Fri 26 Jan. 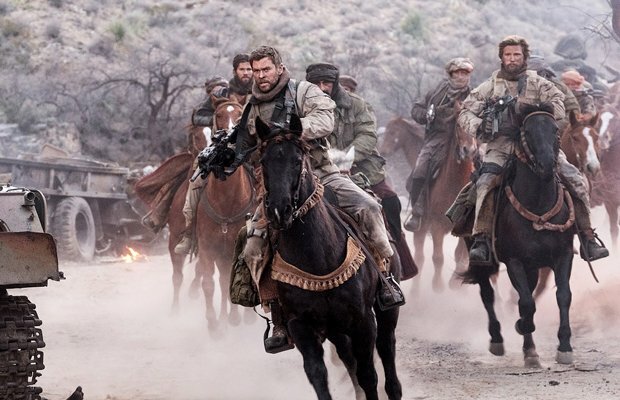 US Army Captain Mitch Nelson (Hemsworth) is put in command of a small unit fighting its way on horseback to a Taliban stronghold. A strong cast and large-scale production don’t quite compensate for a John Wayne-esque story that offers gratifying triumphalism in place of difficult political questions.